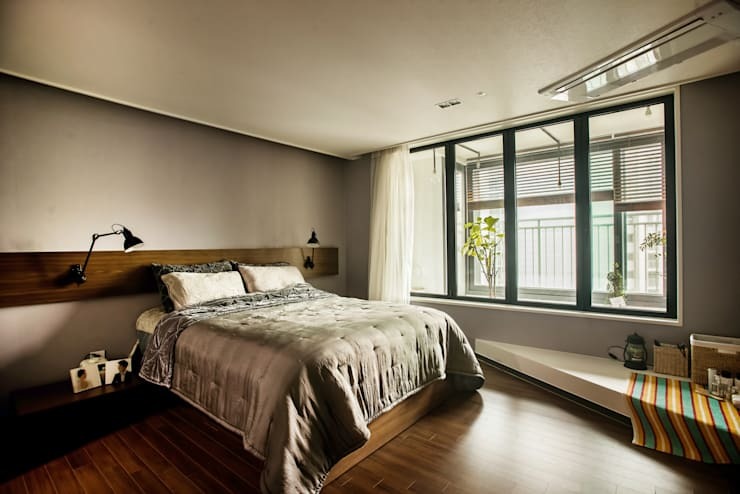 There's a lot to be said for design continuity, particularly when classical styles or quirky eclecticism are often the order of the day, which is why this next home, brought to us by South Korea's Baomida Interior Designers and Decorators, seems so special. Resplendent in cool, grey tones, this apartment positively glows, with its chic interior bathed in sunlight streaming in through myriad windows. The pale tones of grey decor are continued throughout the abode, but far from feeling dour or drab, they're spiced up with lively design elements such as an array of intricate, coloured tiles lining the kitchen and dining spaces, and traditional features like the wooden bathtub and ceiling in the bathroom. Also included in this delightful apartment are a few nifty spaces in which the occupants can escape to work or relax, with a cosy atrium bordering the master bedroom which is bathed in sunlight and houses its own, private garden, and a small office with plenty of storage tucked away for tasks requiring a bit more concentration and discipline. This home is truly a delightful example of understated modern design at its finest. Take a tour and see what you think! Upon entry to this home we are greeted by stylish and comfortable living space that glows amidst an influx of sunshine bouncing off its predominantly grey decor. The pale grey of the walls and ceilings add a subtle warmth within the space relative to traditional white, which is heightened by the incorporation of dark wooden floorboards, and a range of homely textiles. Soft, chequered curtains frame the home's large windows, while the lounge suite adds to the spectrum of grey tones found within. Beautifully crafted shelving units also augment the space, with their subtle, strong design adding functional storage to the home while staying true to its simple, modern aesthetic. 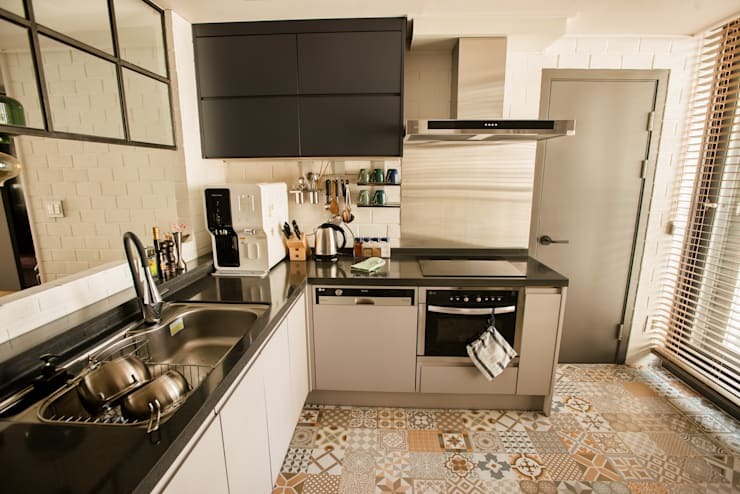 The kitchen continues the prevailing decor of cool, grey tones, with the cabinets and bench tops also decorated in this palette, but augments the grey spectrum with flooring lined in lively, patterned tiles. The colours of the tiles are also relatively muted, although their intricate patterns and contrasting hues still add a sense of playfulness within the space. Adjacent to the kitchen sits a simple, stylish dining space, housing the sleek lines of a minimalistic, wooden setting comprised of table, bench and chairs. 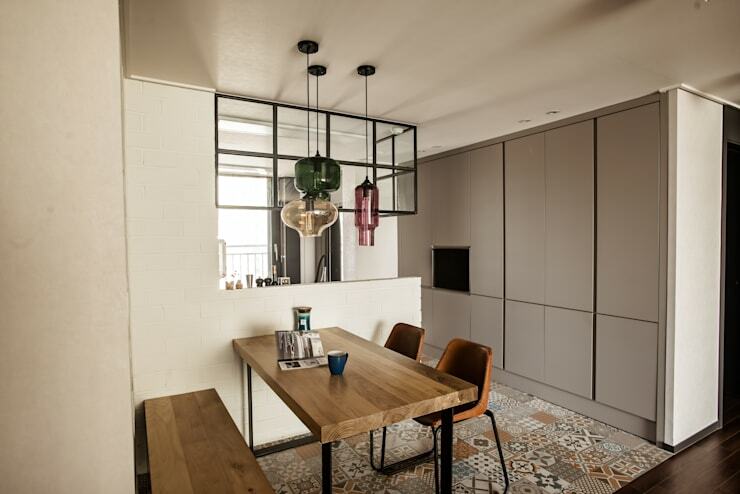 The tiled flooring of the kitchen flows through into this space, drawing focus beneath the understated dining furniture. This vantage also beautifully displays the semi-open plan of the kitchen and dining areas and the array of storage the designers have included within the home, with the series of sleek, grey cabinets seen here adding a necessary element of functionality to the humble plan of this apartment. The furnishings within this space have been kept simple, in line with the prevailing decoration throughout the remainder of the home, with more beautiful carpentry constructing shelving behind the bed, and a small, corner dais included, on which the occupants can perch to read or enjoy a snack in the sunshine. Behind the master bedroom rests this novel, cosy space, designed as a small atrium in which the occupants can retire to relax and unwind. The space is streamlined yet inviting, with its floorboards framed by a pebble garden housing a smattering of pot plants and a shelving unit to display books and decorations. 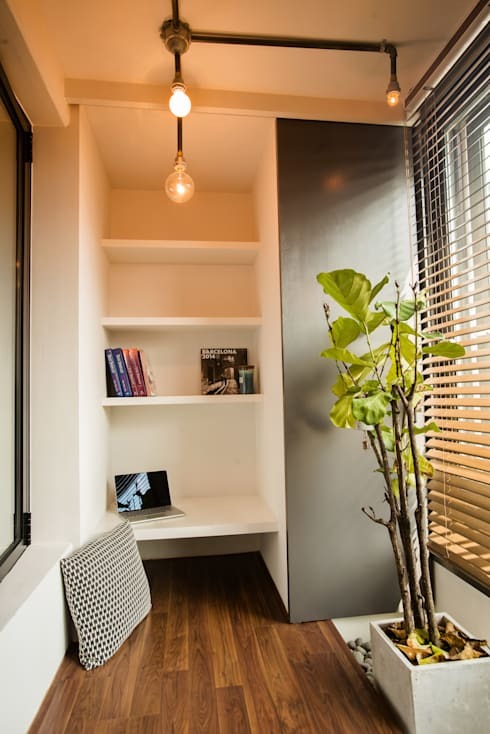 The lowest shelf presents a larger platform, which can variously function as a small desk or in-built table, depending on the needs of the occupants. 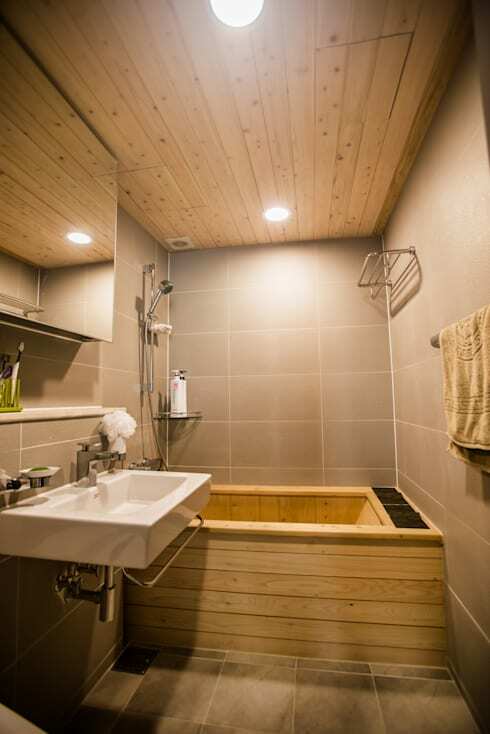 The home's bathroom presents another cosy space dressed in cool, grey tones, although this time its the pale, wooden bath tub that draws focus, adding a traditional, Korean element within this modern design. A wood-lined ceiling reflects the pale tones of the bath, while a pristine, white sink and the sheen of mirror and silver finishes elevate the room with a modern edge. 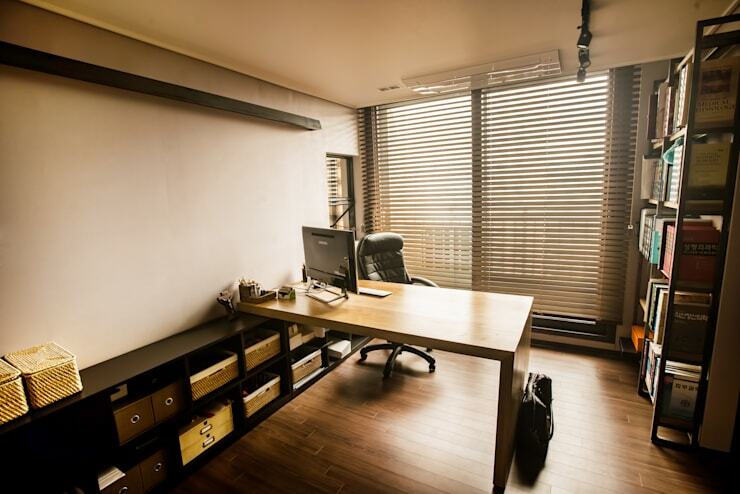 The final room we'll explore in this glowing, grey abode is a stunning and serene home office, which provides a sectioned area to escape and undertake work and daily tasks. The decor and furnishings of the office emulate those already seen throughout this lovely house, with its grey walls drenched in sunlight flowing through expansive windows, and its chic, wooden desk bordered by an array of simple shelves for storage. 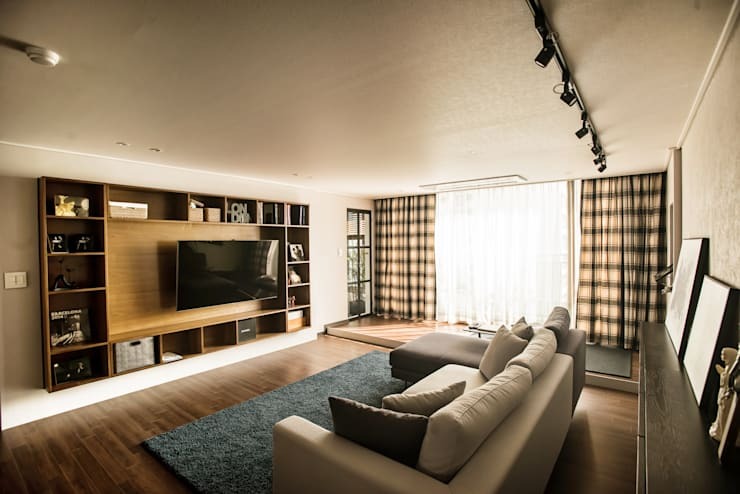 The design continuity within this home is truly impressive, with its understated appeal and high-quality finishes and furnishings presenting a prime example of comfortable, modern apartment living. Need more ideas about how to stylishly decorate your own inner-city apartment? Take a look at A Stylish Spanish Home and get inspired! What's your favourite design element in this beautifully designed home? Let us know below!